Designers and app developers are all the time occupied and wrapped up into their day to day corporate happenings, because they get to face challenges of their work place, they also have to be vigilant and guarded that ‘what to show’ to their clients, because all comprehension, explanation, thought and meanings are to be communicated and unless they are imparted to the clients; they will never get the design granted, and will never approve of it. It is always preferable that you should let the client know about all the keen and brisk steps you took in the formation so he will have no room to doubt about the minutiae and the deportment of the design. When it comes to make an application, it goes through various ladders and components that are implied into the making of it, it is time consuming, overwhelming and it requires focus and thought. You can show the step by step app development through a sketch to your client so he better can have the idea and acknowledgement that what it took to form this application, this is a smarter and professional way to get your designs of application approved. 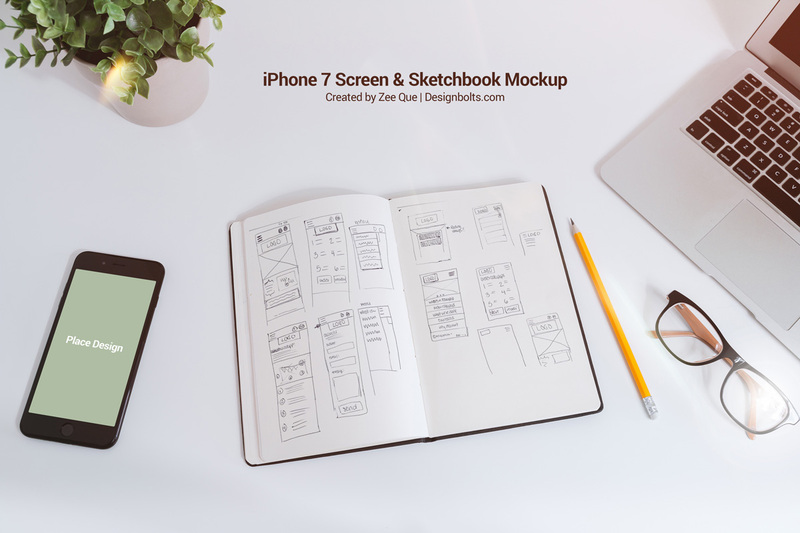 The user interface and application design can be put up in the mockup that I am presenting to you today, check out this free sketchbook & iPhone 7 mockup. I hope giving a different and new touch to your presentations will help you out in endorsements of them. It is hard, it is totally an art to imply inventiveness in every project you do, but all it takes is a little diverse thought and there you are all done in a new way. Stick around for more amazing and yet superb collection of art, tech and design. We shall accompany you tomorrow and forever, hold on to us. Let us educate people about design field and make them aware of its simplicity and intricacies. Here we go!